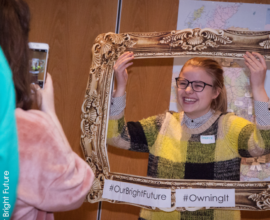 Grassroots Challenge Youth Forum member and Our Bright Future Evaluation Panel Youth Representative, Arwen Greenwood gives an update on the recent Grassroots Challenge Celebration Event. This year’s Grassroots Challenge celebration event was held on Friday 23 November at the Craigavon Civic Centre and was a brilliant success. This is the second year of the project and the impact of the 2018 activities, as seen on the night, was even bigger and better than the first year. The night featured videos and pictures of the year’s activities and young people. There were also guest speakers, the Grassroots Challenge Wheel of Fortune (an activity of thought-provoking questions) and the presentation of the awards. The event was planned by the Grassroots Challenge Youth Forum, with several meetings in the months before to discuss important details eg the venue, set-up, content, invitations, dress code etc. Some of the members were on the stage on the night to introduce videos and guests. 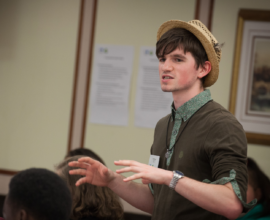 There was also a heart-warming speech from young activist Dara McAnulty, about the importance of co mmunity when helping the environment and how he has found that in the Grassroots Challenge Youth Forum. The guest speaker of the night was Aidan Crean, a bird ringer, with a long history of helping wildlife, including the protection of the Belfast Bog Meadows. He gave an encouraging speech about the importance of not only thinking about protecting the environment, but taking positive action, monitoring that action, and learning how to do better in the future. He was very impressed by all the photos on the slideshow at the celebration night, as every one of them showed young people doing activities for the environment. 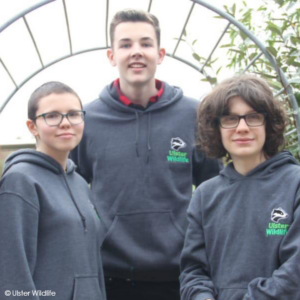 At last year’s event, the audience was asked, ‘what help can young people do to benefit the environment?’ This year, the question was turned on its head, and the audience was instead asked ‘what benefit do young people get from helping the environment and wildlife?’. The feedback from the attendants will shape the Grassroots Challenge activities in the future. 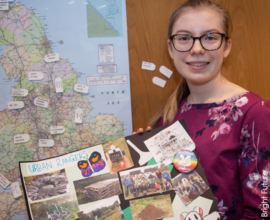 ‘Winning an award was something that I was really proud of, especially as I really enjoyed taking part in my Grassroots Challenge DofE. I feel that this award will enhance my UCAS application. I was also very happy that my grandpa was able to watch me receive my award’. Lastly, congratulations to all the groups and individuals who won awards. 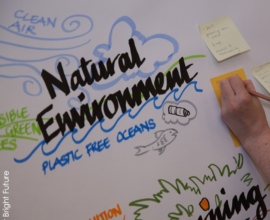 They inspire us all to be more engaged with environmental work. Next year, we hope the event will be even bigger, better and more inspirational that this year!